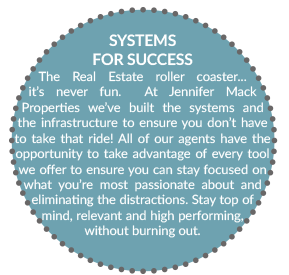 Are you a newly licensed agent looking to join a rock star team? Or a seasoned agent not getting the results you hoped for? You have come to the right place. Having a successful career in Real Estate is hard. Sure it offers freedom and flexibility once you have your business established but it takes a lot of hard work and dedication to get there. 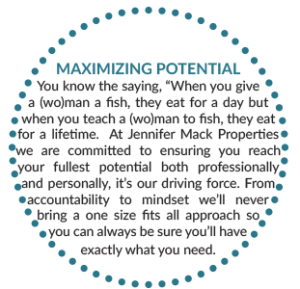 Jennifer Mack Properties brings over 20 years of combined real estate experience with hundreds of families served throughout the DC Metro area. We will teach your how to build your business from the ground up. We have systems in place that you will use from day one to help you start off on the right foot. Our state of the art CRM and leads system will outline specific tasks daily so you will know exactly who to call. In addition to providing you with leads we will teach you how to leverage your contacts to build your database quickly. 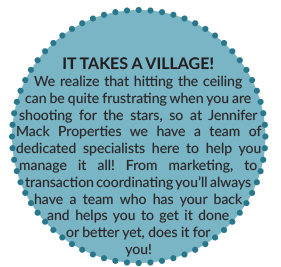 Our team of support staff is there to ensures you can focus on your ONE thing…selling properties! Then contact us directly but sending an email with your resume, DISC assessment and a brief introduction to your real estate career.